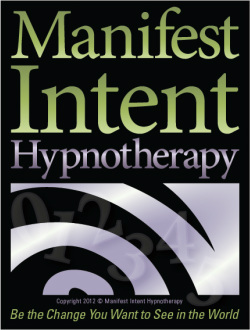 Manifest Intent is a mind-body practice with a core foundation in medical hypnosis, a goal to remain highly competent in advanced techniques and new skills through continuing education. My mission is to mirror Gandhi's philosophy: " ...be the change you want to see in the world." Sessions are tailored to each unique client. Located in eastern San Diego county, areas served include San Diego, East County (El Cajon, Lakeside, La Mesa, Santee), North County, South Bay, and the back country of San Diego, including Jamul, Dulzura, Campo and Boulevard. With modern technology, clients from any location in the world can be "seen" via your phone or Skype. Hypnosis is scientifically proven to be the fastest, most effective and side-effect free way of creating permanent positive change in every part of a person's life, particularly habit and pain control. Hypnosis is natural, the perfect means of working with the total person, mind and body. You will feel rested, relaxed, happy and satisfied that you are finally becoming the person you want to be. Believe me, I know hypnosis will work wonders for you, too.